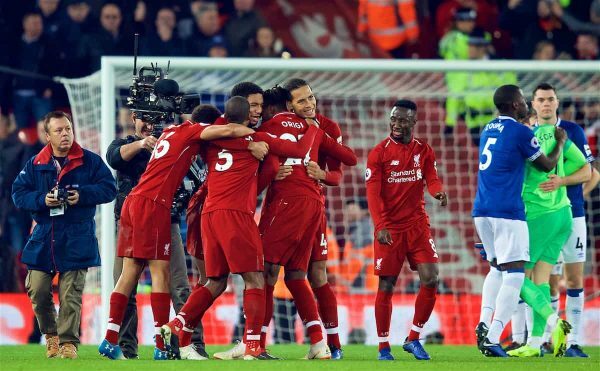 A bizarre stoppage-time winner from substitute Divock Origi secured a crucial Merseyside Derby victory in the most dramatic fashion for Liverpool. 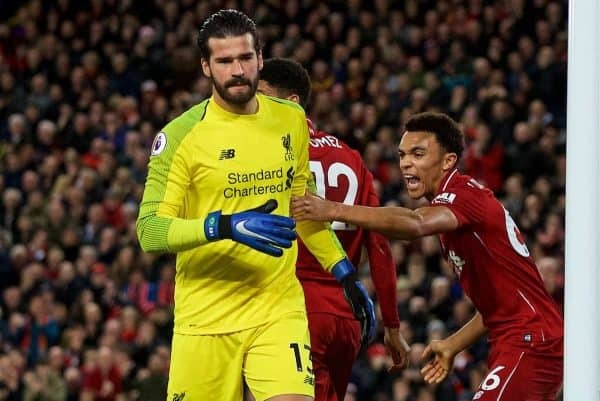 Following an exceptional midweek performance in which the Brazilian goalkeeper was one of only a handful of Liverpool players who played well against PSG, Alisson again made the difference on this occasion with a remarkable close-range reaction stop from Andre Gomes in the first half to deny a certain goal. Alisson’s calm distribution and willingness to move the ball forward quickly was evident throughout, demonstrating once more why Liverpool paid the big money to upgrade in this key position in the summer. Some Everton fans had claimed in the buildup that Jordan Pickford, who has been linked with a £70 million move to Man United, is superior to Alisson. This match proved that’s far from the case! It’s been a difficult start to Fabinho’s Liverpool career, but after a gradual period of bedding in, Klopp has started to place more trust in the former Monaco man of late. Here, he showed exactly what he can bring to the team with a midfield performance full of bite and tenacity, as well as positional intelligence to break up Everton’s attacking moves and quickly get Liverpool back on the front foot again. An excellent piece of pressing in the first half set up Liverpool’s best chance early on, releasing Mohamed Salah to feed Xherdan Shaqiri whose shot was well saved inside the box. On this evidence, Fabinho more than deserves to keep his place in the side. Roberto Firmino has been well off colour for the majority of the season so far and has looked somewhat lost on numerous occasions in his new deeper role, with Salah occupying the centre-forward position. 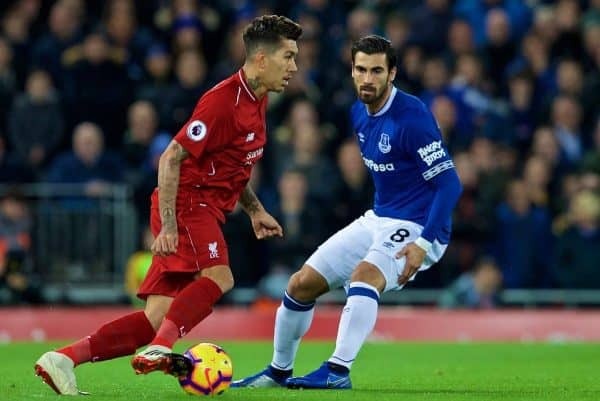 Not only was his influence in an attacking sense severely limited once more, but Firmino was also guilty of surrendering possession in dangerous areas on more than one occasion, particularly in the first-half, presenting Everton with several counter-attacking opportunities. It was a surprise to see Salah replaced before Firmino, and there’s a strong case to take him out of the lineup for the midweek trip to Burnley and perhaps give Daniel Sturridge a start up front. 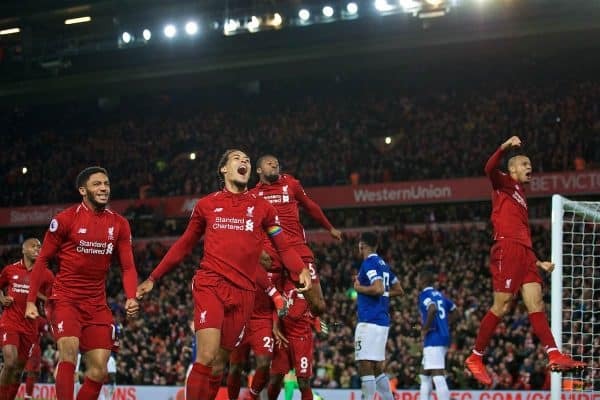 Liverpool have had their fair share of dominant, comfortable Merseyside derby victories at Anfield in recent times, but on this occasion Everton proved much sterner opponents than they have in some time. The attacking verve brought by Brazilian duo Bernard and Richarlison gave the visitors a genuine threat in the final third, while the guile of former Barcelona man Andre Gomes offered a controlled, assured presence in midfield. Everton did indeed come close to scoring on multiple occasions, most significantly with the double-clearance off the line from Alisson and Gomez in the first half. Liverpool managed to grab the three points at the death, but this was a much tougher task than it has been for the Reds against the neighbours in recent times. 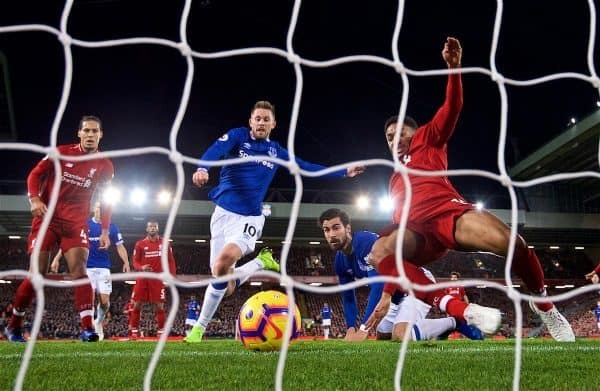 But the Toffees still haven’t won at Anfield this century, and even in the closing minutes before the goal they were looking to run down the clock and take the point, so different ambitions still exist at the two clubs. Divock Origi’s Liverpool career has long felt as though it’s been in its final chapter, especially after a poor pre-season that saw him linked with a move away from Anfield. But the Belgian came off the bench to write his name into derby folklore with a vital stoppage-time winner in the most absurd manners possible. He nodded in a header from close range after Jordan Pickford flapped at the ball following a scuffed shot by Virgil van Dijk which had bounced back off the bar but even before that he’d been a threat. Origi had missed a sitter only minutes earlier, crashing his shot off the bar with the open goal gaping, but this decisive intervention right at the death bagged a crucial three points to keep Liverpool in touch with Manchester City who had opened up a five-point gap on Saturday. It was bizarre in the extreme but will go down as an unforgettable derby moment which could well prove pivotal in Liverpool’s season. What this shows is the power of having a strong squad, with Klopp having recently discussed the importance of every player being fully involved and ready to play their part. 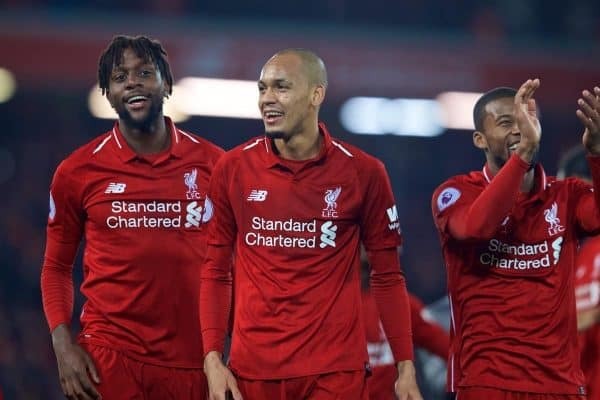 It was also fitting for Origi that he should get the winner, and the acclaim of the Kop, having been on the receiving end of a horror challenge from Funes-Mori in this fixture in April 2016. At the time, Origi was Klopp’s first-choice centre-forward and in good form, but the injury resulted in him missing the Europa League final and struggling to recover since.